← Forest Village #10: A Crowded Island? It’s a snappy title for this section, but in fact the six sites we identified in our quick and crude site-search weren’t all perfect; far from it, in fact. One site had the wrong geology, heavy clay rather than a sandy soil cover. Another was an isolated block of forest bordering the site of a historic monument, and so was regarded as too sensitive. A third was eminently suitable, other than being immediately adjacent to a very large planned urban extension that was already well advanced through the planning system. Each of these was immediately ruled out for further consideration. 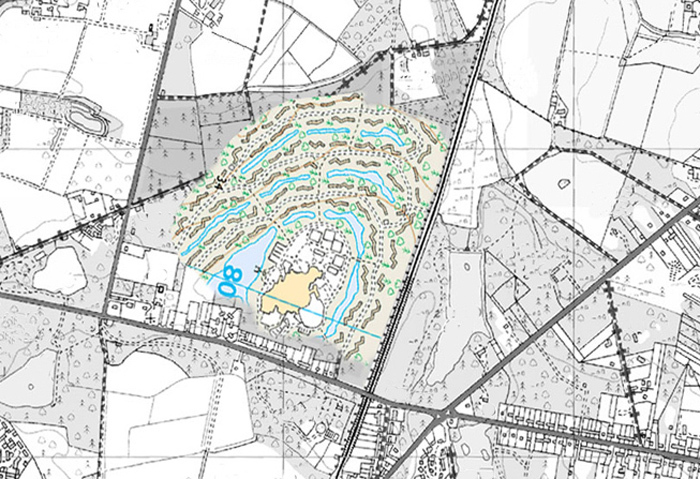 Two further sites were marked as ‘Maybe’; both had the right geology and were adjacent to higher-order centres, but both had fairly high relief – steep slopes which would make construction more complicated, particularly if the idea of new lakes like Elveden was to be pursued. One site stood out: the geology and topography were ideal, and it was part of a larger network of wooded areas. It was in an area of high housing demand, a couple of miles from two large towns, and there were 11 secondary schools within 4 miles of the site. It was 8 miles distant from a motorway which would give access to central London in another 35 miles, and one end of the site was only a kilometre from a train station with a good commuter-service into London. The site was a bit small at only 70ha, and had come through our 150ha ‘sieve’ as one half of a larger block of plantation bisected by a main road. For the purposes of carrying out some feasibility work, however, it was more than adequate. Above: Capacity study; part of Center Parcs Elveden superimposed on the site. We presented our findings to Forestry Commission ‘HQ’ in Bristol and then had a preliminary meeting with the local FC team and their retained land-agents. At this meeting, however, it emerged that the site was being discussed in connection with an urban extension adjacent to one of the nearby towns, with planned enhancement as recreation-space for the new development. These plans were at a very early stage but they certainly muddied the waters. Also working against us was the gathering storm of public opinion over the recent announcement of the new government’s forest sell-off plans. So when it came to the crunch question at the end of the meeting – ‘Would the Commission be able to fund a demand-study and some financial modelling?’ – the answer was an apologetic ‘No’. After two years of periodic activity a fair amount of day-dreaming and a lot of interesting discussion, Forest Village had finally hit the buffers. Next post: Forest Village #11 – An Epitaph? This entry was posted in Architecture/Design, Development/Land-Use and tagged development, Forest Village, Forestry Commission, land-use. Bookmark the permalink.